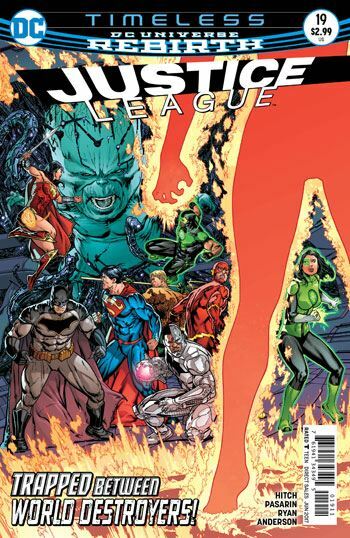 So the Timeless story arc comes to an end in Justice League #19. 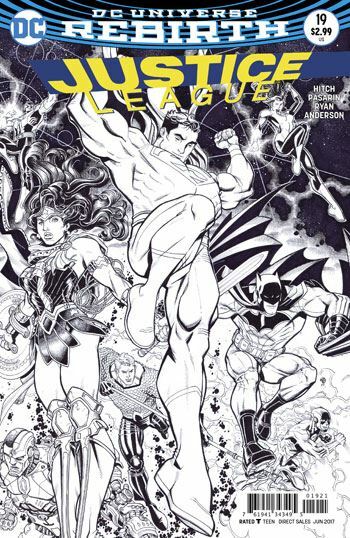 Unlike the previous issue, in which the League had to work together, despite being scattered through time, to destroy a bunch of machines, in this issue the League has to work together, despite being scattered through time, to destroy a bunch of machines. As always, the high point is Pasarin’s art. Although even that seems a little messy and off, as far as the machines are concerned. I can’t fault him too much for that. How many interesting ways are there to draw the same giant machines, issue after issue? The story seems to be a lead in to the conclusion of Rebirth. We have been told, by pretty much all the various characters, with their differing agendas, that something really big is coming, centred on Earth, because of the heroes located there. Some of the bad guys want to wipe out the heroes, some want to move Earth out of time to prevent the event. They all agree that something bigger and more dramatic than anything seen before is about to hit. That might all hold more weight if the basic concept had not been being restated in virtually every issue since this book began. The only moment in this issue that sparked me at all was the death of one of the kids from the future, the ones who I thought might be a reworking of Infinity, Inc. As the person dies, they say that nobody knows what they are doing. Yup. That is true indeed. I have no idea. The accuracy made me laugh, but not in a good way. I also don’t really care.